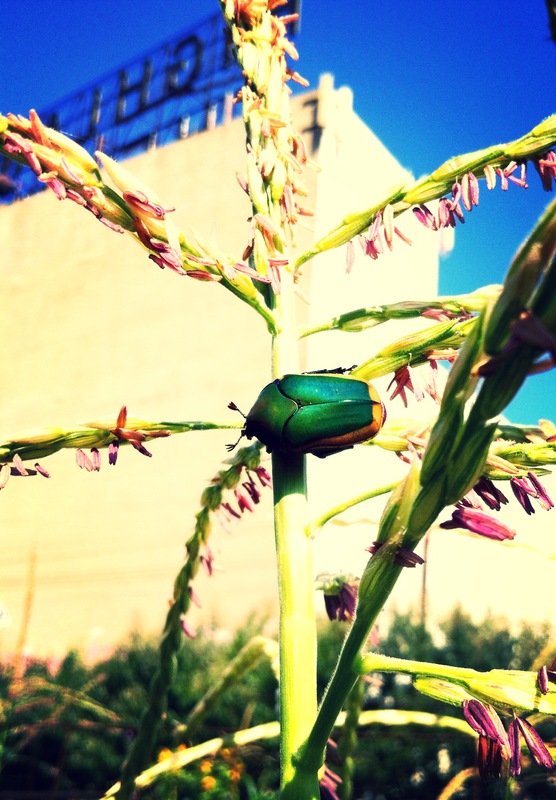 Not a June Bug, but a Figeater beetle feasting on corn pollen at Milagro Allegro Community Garden. It is August in Highland Park. Which means that it is time for FIGEATER BEETLES! Iridescent green and gold, your flight ever so bold. 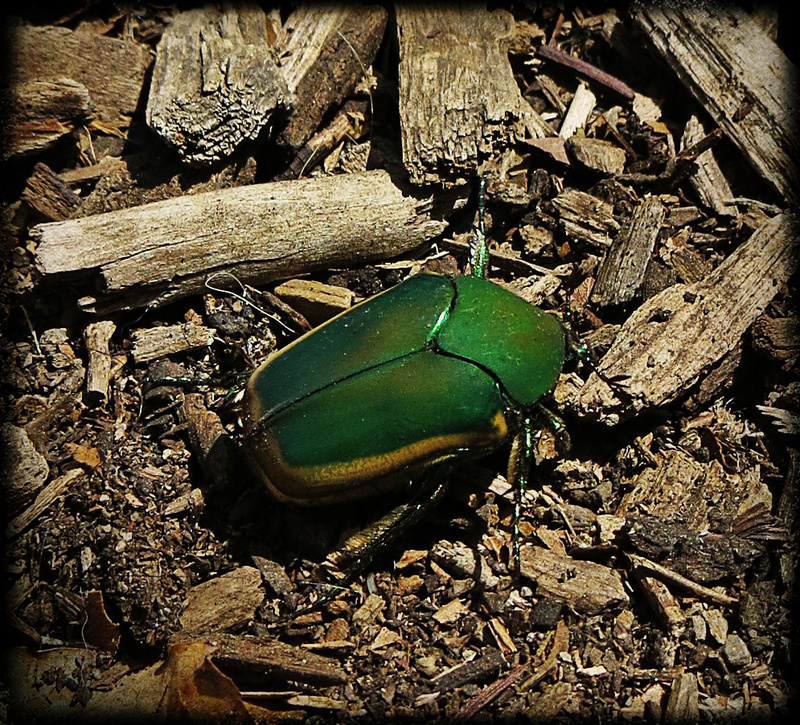 Cotinis mutabilis, the Figeater beetle is not a June Bug. And yet, that is exactly what many of us (myself included) have called this beetle all their lives. (Blame the yoke of the East Coast transplants to Los Angeles.) But then again, we should know better: June Bugs emerge from the soil in June. Whereas the overshadowed Figeater beetle emerge and take their sloppy flight in August. Figeater beetles are common to the southwest United States and northern Mexico. Like their eastern cousins, the June Bug, they are notoriously poor flyers that have the capability of achieving a 100% Success Rate at flying into your hair, regardless of where they are actually trying to go. But while they are quite annoying when airborne, they unlike their eastern cousins, are not brownish green, but a gorgeous iridescent green and gold. The Figeater spends most of its two-year life living in soft soil and compost piles as larvae, eating the same things that pill bugs, and earwigs like to eat. In August, the Figeater takes flights, feasts on Figs, nectarines, peaches, plums, sunflowers, and pollen-plenty flowers. It mates, lays tiny yellow eggs in the soil, and drops dead to the ground to menace us no more. ← The Next Twelve Years? I grew up knowing what a june bug is we have them little browm bugs. we call these mayates.